Should somebody else have gotten the blame?! 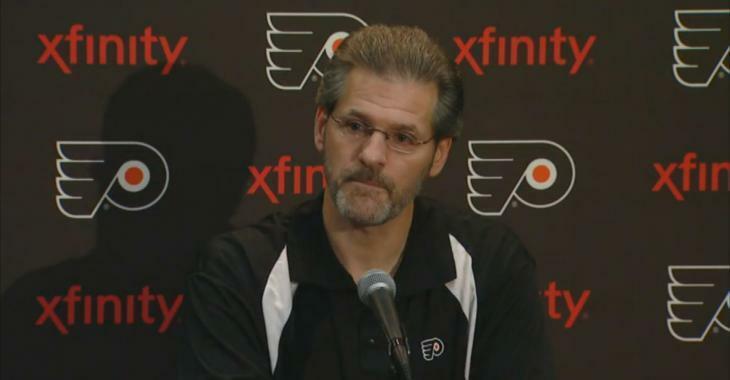 Former Philadelphia general manager Ron Hextall revealed that he was stunned the Flyers fired him this week, despite their losing record. The former Flyers goalie was fired Monday after more than four seasons at the reigns of the club. On Monday, team president Paul Holmgren said he fired Hextall because it had ”become clear that we no longer share the same philosophical approach concerning the direction of the team.” The Flyers are currently 10-12-2 and in last place in the Eastern Conference. While Holmgren did not give a full vote of confidence in head coach Dave Hakstol, he did state that the next general manager will decide Hakstol’s fate. Hextall was known to be a patient GM and had always preached patience and tried to rebuild the Flyers through the draft instead of making short-term fixes with high-priced veterans. However, it was enough for Holmgren to give him the boot. "There were a lot of things that just went the wrong way on us,” Hextall said. Philadelphia had two first-round playoff exits in Hextall’s tenure and so far, the Flyers show no sign this season of winning the franchise’s first Stanley Cup since the back-to-back titles in 1974-75. While Hextall admitted on Friday that he was wrong to deny former players access to the locker room during an alumni game, he remains adamant that he was close a few times on making a major deal or signing a key free agent that could have helped the Flyers.